Cigarettes are bad for you. We all know this. We all hear this pronouncement every day every where. But what they are not telling you is that although cigarettes might cause cancer, heart disease, and a host of other deadly diseases at some future point in your life – there are more immediate threats posed by smoking. These more immediate threats have only come about in more recent years ever since cigarettes started getting banned everywhere you go and smokers are forced out into the dangerous elements in order to have their nicotine fix. Pneumonia. 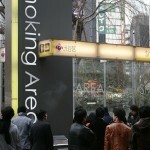 As smokers have been forced outside in all kinds of weather, they now face an increased risk of contracting pneumonia. Skin Cancer. We all know that direct exposure to the sun’s rays causes skin cancer. Smokers, unable to stay inside to smoke during the blistering hot days of summer are now being exposed to the harmful rays of the sun on an unprecedented scale. Drive-by-Shootings. Office workers, forced to stand outside to smoke in crime-ridden neighborhoods are increasingly becoming the victims of drive-by-shootings as they are innocently caught in the crossfire. West Nile Disease & The Bird Flu. Instead of being allowed to enjoy a smoke in the safety and comfort of enclosed and protected areas, smokers are now exposed to all kinds of diseases which are spread by insects and other forms of wildlife. Malnutrition & Starvation. As the cost of buying cigarettes skyrockets, many smokers and their families are now exposed to the very real risk of malnutrition or even starving to death right here in the richest country in the world. Being forced to choose between food and cigarettes during these difficult economic times is managing to take food right off the tables of tens of thousands of formerly well-fed Americans. Recession and Depression. While political and economic pundits are searching for reasons for the recent economic crisis in America, the real answer is staring us all in the face – huddled outside doorways and on street corners all across the land. As the cost of smoking goes up and up and up, millions of Americans who would have previously been spending money in restaurants, shopping malls and online or investing money in the stock market or savings are instead spending all of their income on cigarettes. So, you see that the issue of smoking being bad for your health is a lot more complicated than it is usually presented to us by the health care community, politicians, and the media. The next time you see a group of people smoking or a lone smoker in a doorway somewhere, think about the negative consequences of trying to “save” their lives or even your own through harsh anti-smoking legislation. Remember: Smoking bans & high tobacco taxes are harmful to all of us – smokers & non-smokers alike – and should be avoided at all costs.